Small DB2 performance monitoring program, shows active connections with lock information, SQLs in db cache, database snapshots, database objects information, list history. Can help resolve locking problems, identify worst performing queries. DB2Mon client is win32/win64 only. Monitored server is any of UDB 6.1-9.7+ Window, Unix and Linux. Small fix for reorg check. Added option to save last user/password. By default it's off. First attempt to re-write tablespace snapshot view for ESE. Version 8.1 dll was not working with bare 8.1 client (no fixpack applied). Fixed. Switched back to context usage for attachment. Please let me know if new version is not working for you. Added additional information and reorg status monitoring (v8 specific, use table monitor view). Table switch must be on in order to get reorg info. Some people experienced the problems with 8.2 db2mon dll when working with 8.1 db2 client. Added 8.1 dll. Fixed crash when parsing application snapshot with statement subsections (ESE with DPF). Added internal monitor tracing. Recompiled version 8 with 8.2 libraries. Fixed lock dependency for the deadlocked applications. Added option to filter ReorgCheck results by schema. It should speed up calculations for the system with large number of schemas/tables. Added option to visualize lock dependency between applications (A depends on B which depends on C), to access - right click in application window and "Show lock dependency". Added raw snapshot save/load(Edit->save/load). No connection is required for loading(replay mode). 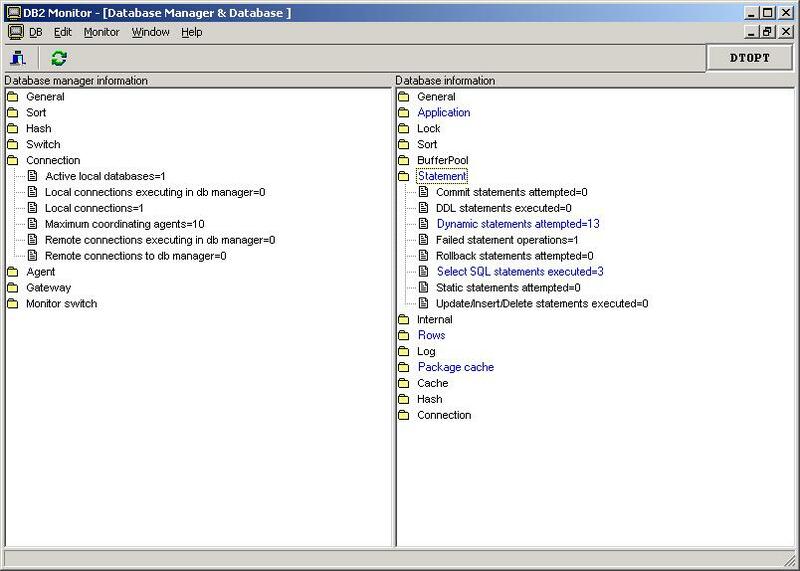 Maintenance release - added new attributes introduced in latest DB2 fixpacks. Fixed agentid value for lock monitor in v7. Added "Agent Id" for the locks snapshot. Fixed tablespace monitor for v8 and DMS/SMS configuration. Removed all changes related to context switching (multi-instance attachment, environment clean up) - too buggy (or I do not know how to use it correctly :(. I've finally fixed the node selection on attachment. Fixed XML output for tablespaces and bufferpools monitors. Partially fixed node number selection during attachment (EEE/ESE with DPF) - added "default" option (do not touch system settings). Not visible node selection is equivalent to default - I'm not using "set client" to specify node. Currently I can not find an API method to reset node after attachment attempt. I know how to set it, but there is no method to reset(and I can't get a default value if %DB2NODE% is not set). You can either manually specify correct node number or open/close program (db2 terminate analog). Added node number selection during attachemnt (EEE/ESE with DPF specific) - use small button with '^' on top of the window. Fixed minor bugs. Fixed v7 and v6 dlls link and content. Added "Db Browser" - information about tables, view, indexes, etc. Not finished. Added "List history" - history information about backups, reorgs, etc. Internal code reorganization, various bug fixes. Due to internal code reorganization and massive changes, the version can be unstable (I tested it fairly well, but...). By default, new version is shipped with v8 dll. If your client version is not v8, please download the corrpesonding zip file and replace the db2mon.dll. In theory db2monitor v7 dll should work with v8 client (not vise versa). Multi-select save/force for applications. Custom attribute in application window. Added explain ability (via dynexpln and epxlain/db2exfmt combo). Changed application window - more detailed application and statement information. Added support for new statements in cache between snapshots - highlights changed Execution/Preparation or full line if statement is new. Fixed bug with incorrect monitor switches setting. Download this version and check switches option, if you have version with 8-beta support (after 07/30). Added drop down list of cataloged dbs in attached instance. Added auto-refresh option - 10s, 30s, 1 and 5 min, default off. The setting value is not preserved across program restarts. Added db2 8.1 beta support, just few new variable parsing, like memory pools. Because of lack of pre-8 support in the beta, separate dll is required. First attachment is performed using version 7 dll, the attached db version determined and v8 dll is loaded, if necessary. Addition of container information on tablespace snapshot screen rerquires window redesign. I'm lazy, if people think they need it, email me, probably I will add it. In general if you have any ideas about program improvement, please share.